A plant processing canna rhizomes, run by an affiliate of the Company of Economic Cooperation (COECCO) of Vietnam, was inaugurated in Phaxay district of Laos’ Xiang Khouang province on December 14. Covering an area of over 20,000sq.m., the plant was built with the investment of more than 1 million USD and is part of a key COECCO project in Namxiem village in Xiang Khouang province. 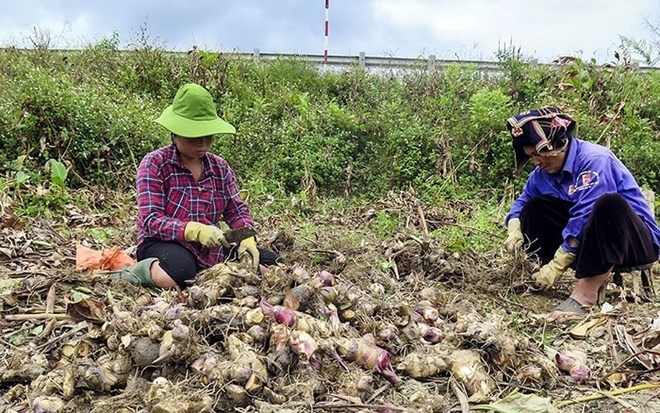 It is hoped to bolster advanced agriculture in the locality, as well as generate stable incomes of around 15 million Lao kip (1,755 USD) per year for local people. Following two years of implementation, up to 100 households in the locality have participated in the project. Speaking at the ceremony, head of Namxiem village Giang Nhia Lau said since 2016, local residents have greatly benefited from the project as they have been given permanent jobs, thus contributing to the growth of the locality. The canna plant rhizomes are key ingredient in making vermicelli noodles. The vermicelli made by local people has gradually become well known both in Laos and Vietnam thanks to the project, Lau noted, voicing his gratitude to local authorities and COECCO affiliates.